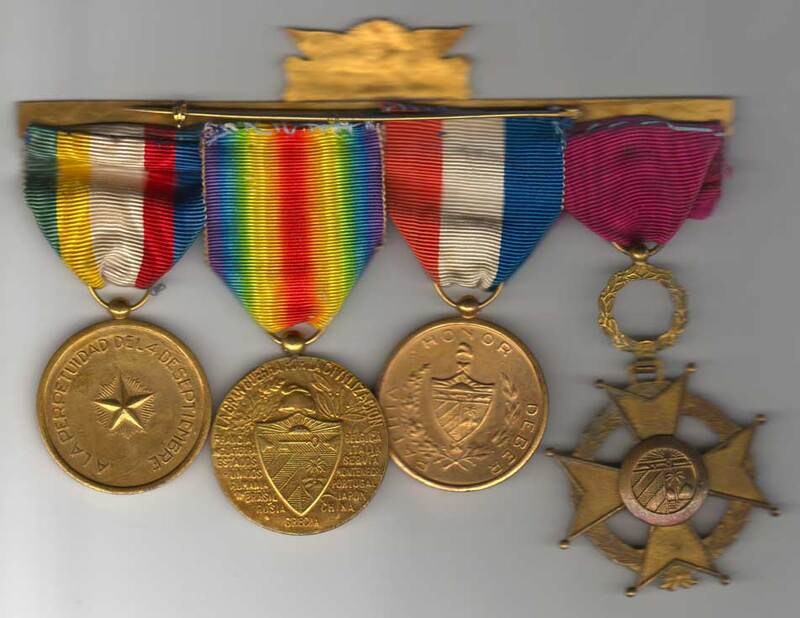 As we start out, we can use this thread for Cuban Victory Medals, types, variations in medals/ribbons, etc. Here is a Cuban group from the mid 1930's with a locally produced gilt finished vic, mounted on a nice 'Libertad' bar. I have a number of cuban vics and this is one of the gilt variety. * Order of Military Merit 4th class cross, with dark red enamel. * Long Service medal, with 5 chevron devices. 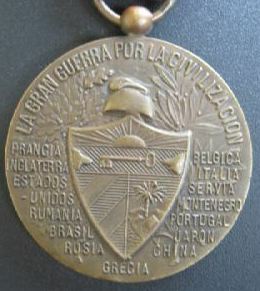 * Unofficial Cuban victory medal. * National Reconciliation medal, with 1 star device. 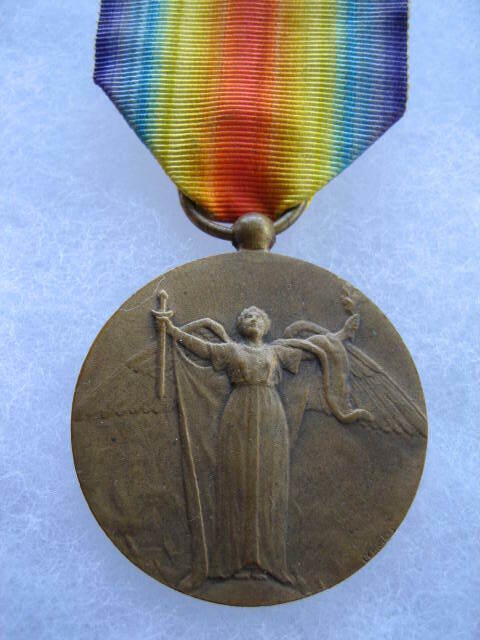 The victory medal was not made by Chobillon in France and accordingly does not have the 'C.Charles' makers mark on the obverse. This vic was produced locally in Havana by the firm of Vilardebo & Riera. 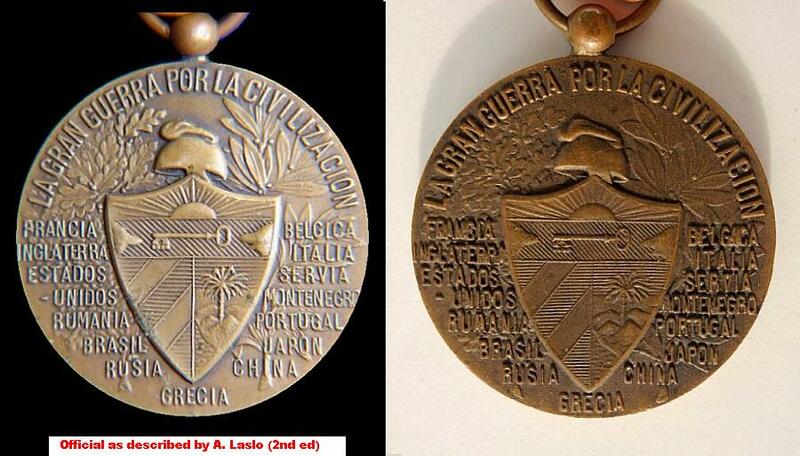 They were the official maker of the Cuban Army medals and decorations. It very closely resembles the official vic strike from Chobillon. Yes the cuban group is a nice one. I actually picked it up while looking for a totally different vic item. Right time and place. It is however, becoming a bit more difficult of late to obtain good pre-revolution cuban material. Here is a pic of an official cuban vic. It was produced with a gilt finish by Establishments Chobillon in France, has the 'C.Charles' designers name on the obverse, as well as the Chobillon triangle hallmark and BRONZE impressed on the edge at the 5 and 6 o'clock positions. It is also attached to an attractive local Cuban decorative suspender. First of all: Hello to everybody contributing to this wonderfull string of posts. I read them all. I collect WWI VM's for around 5 years now, bought the book of Laslo (2nd ed.) and thought I knew a lot. Till i start reading this string ......... the knowledge of some contributors, the photo's, the details. I stand in awe. At the moment i posses most VM's in original. Only Brasil and Siam are missing. I use a modern good looking repro as gapfiller. (sorry). I also have all official Army and Navy bars to the US VM. I enclose a picture of my Cuban VM. I bought this one 2 years ago thru e-bay and paid not that much. When it came to me in the mail and i checked it, it looked good, had the marks in the rim etc. What do the experts think of it. Welcome to the thread and nice to see a couple new members adding to the thread! You Cuban example looks quite nice and correct in my opinion, congrats! I still need to add one to my own collection one day. Welcome to the thread. As Tim stated, it is good to have a few more collectors here to share and enjoy. Yes you have a nice official cuban vic in good condition. It is in very good condition as there is little wear on the face and feet on the obverse and the cuban arms on the reverse. The BRONZE and 'AC' Chobillon mark are nice and strong. A nice example. Hello to all, Herman I to would like to also welcome you. But, I do not agree with Tim & Rob that this is an official Cuban Victory Medal. There are many differences between your medal and the official medal. 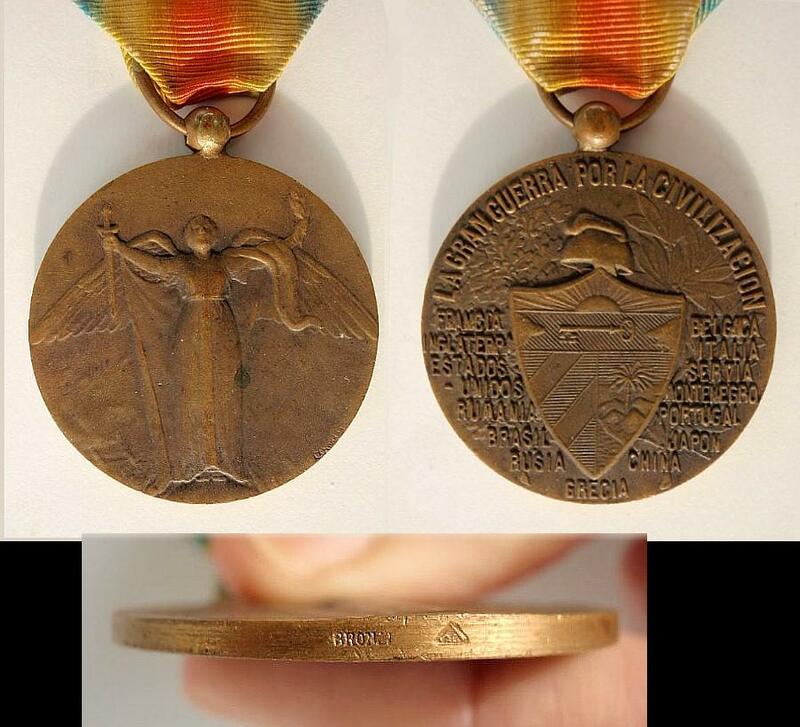 The photo I posted is the official Cuban Victory medal. a) The letter "F" in the word "FRANCIA" is over the letter "G" in the word "INGLATERRA", where-as on the Official medal the letter "F" is over the letter "N". b) There are two upside down "W" used in place ofthe letter "M" in the words "RUMANIA & MONTENEGRO". c) Note the word "GRECIA" and how it bows upward on the last two letters "IA". But not so on the official medal. d) Your medal, in its shield there are almost twice as many lines behind the key and the palm tree. Must less on the official medal. e) The plant stem is between the "RU" in the word "RUSIA", on the official it is clearly under the letter "U". f) The other plant stem is under "N" in the word "CHINA", on the official it is clearly under the letter "I". 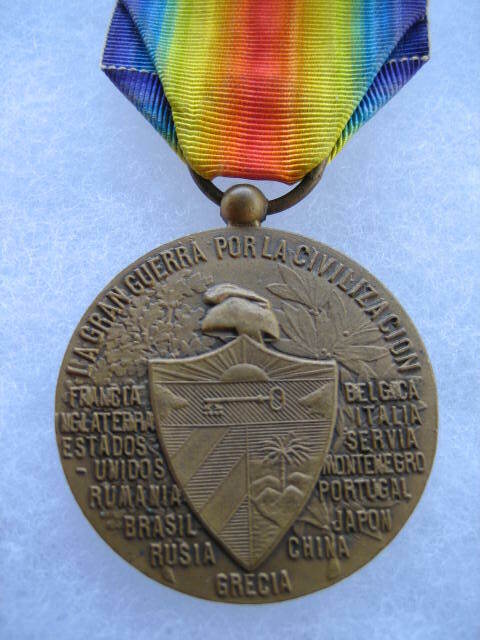 g) Just check the word "BELGICA" on your medal, note the letter "I" and see how its filled in. You see that on sand castings not on a metal striking. Also check some of the other letters for this same fill. h) On your Cuban, almost all of the countries names are touching the shield either with the ending letter or the first letter in its name. 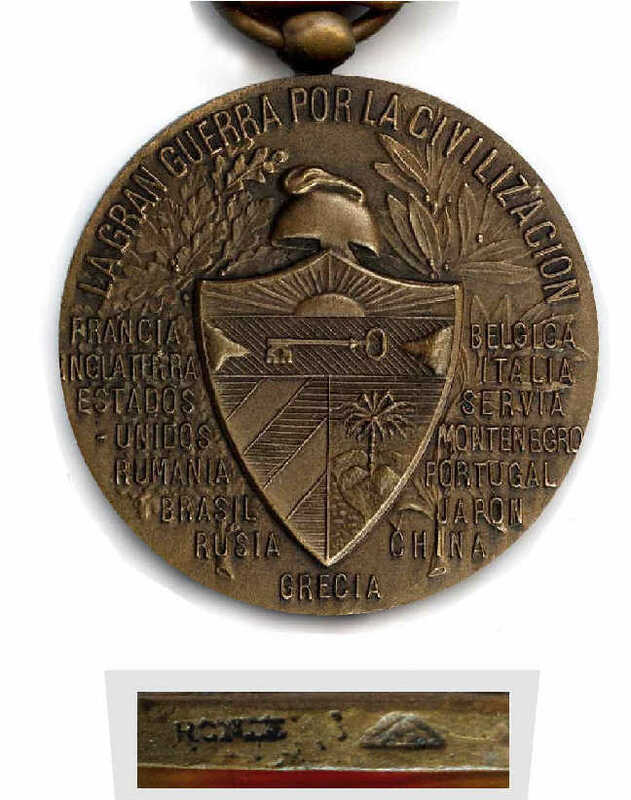 On the official medal there is spacing between the names and the shield in all but Montenegro. There many more differences, in the helmet, the leafs and the olives placement. If you have a Alexander Laslo's book go to page 22, figure19 and you decide, put a glass to his photo, then ask, is you medal like the one in the book, or is the one I just posted like the one in the book. Both, yours and the official medal have the Chobillon hallmarks. Remember they also made some"known" unofficial medals using this same stamping. (see) France unofficial type-1 by the same designer Charlie (Chobillon hallmark and the word bronze). I believe this would class as an early repro. Hello Rob, you posted on 30 Sept 2009, post # 119 in this tread, a gild Cuban Identical to the one I am posting now. Thanks for your replies. Especially Johnnymac. You convinced me. I have a second Cuban VM. When I am at home tonight (it is around 18.00 lt now here in the Netherlands) I shall check this one aswell. If i'm in doubt i shall post some pictures and hopefully Johnnymac can do his evaluation once more. Again guys, thanks for the replies. I hope to post some more examples from my VM collection in the near future. F.i my Belgian VM with a mothers bar, or a Belgian/French VM with a clean unmarked reverse. Yes, an interesting observation. I have never noticed the slight differences here and checking my file PIC's have seen other examples similar to the one Herman has shown. Interesting that Laslo does not mention this type in his reference, though I suspect he either didn't know of this version or it came out after his reference. Based on the condition of the examples shown however, I suspect they are period and Laslo was not aware of these variations at time of his work. For ease of reader's comparison, here's an original compared to one of these "other" versions. You can see the die differences. I might add that the details are a bit softer and I think the case of the lettering appearing different, might be just "fill" in the areas surrounding those letters in question, making them appear slightly different due to lighting. Dirty or cheaper die? Still, the spacing and orientation is clearly different between the two examples. Thanks for pointing that out as it's another point to look for when shopping for a Cuban Vic. 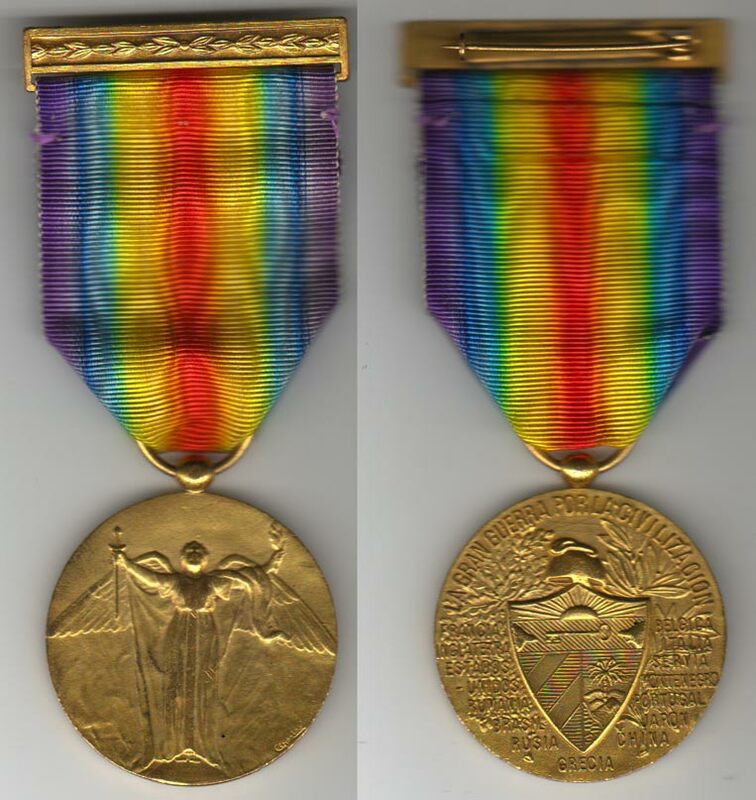 Tim, I too believe this medal to be a very early version, maybe as early as the 1920' or 30's. This Cuba has the Chobillon marking and BRONZE in the rim. I add a picture of the reverse in the next post. Gents, I want to apoligize for the quality of the pictures in the string of photo's of today. I don't have the rights yet to add good quality pictures. 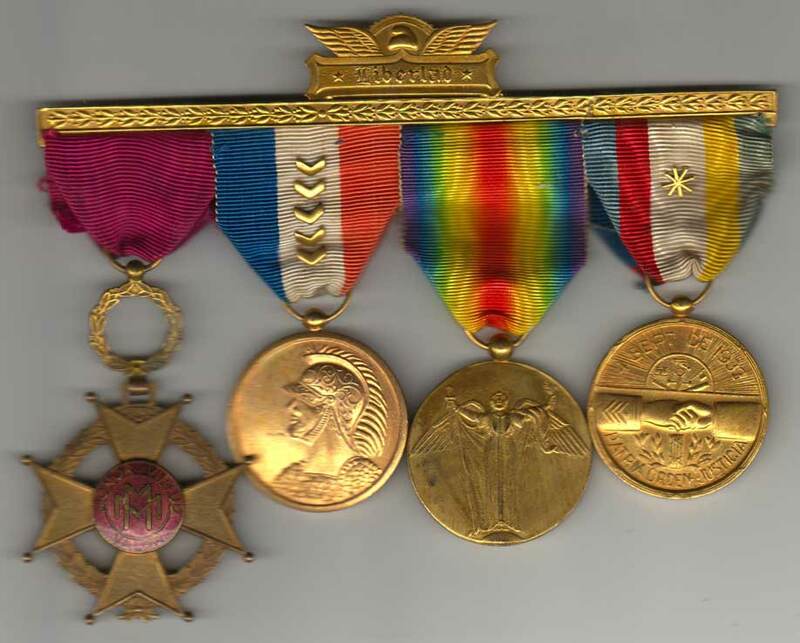 Furthermore the pictures of the reverse of the medals were impossible to make without breaking down the presentation frame in which they are grouped. and the reverse of my Cuban VM. (A picture i had in my computer). A fine example of his poor-quality offerings. I have noticed this bidder, bids on a lot of things. When he sets his mine to the fact that he wants it, he put a very high number so matter what you bid you will lost. He just won all four items and all four are sand casted items? I post this to say to all members, if you need help in ID-ing something reach out to one of the many forum members for a second opinion by sending them a personal email. In the light of those rough sand-cast copies - do you think this one is the real deal? It's a bit beat up, but it has BRONZE and the AC in a triangle mark on the edge. Hi Bill I loved your posting on Brazil yesterday day. 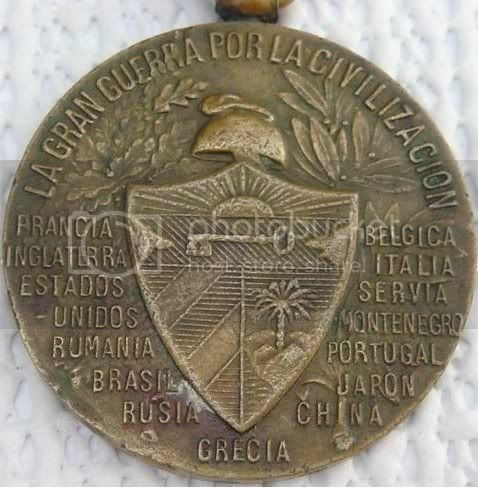 As for this Cuban Medal you posted, in my mine the medal is original and that is even without seeing the marking on the rim. Many thanks for your opinion on the Cuba vic. That French web site is very interesting - lots of good solid info to read through, and the odd unusual item to find. Definitely a good copy. If it has the BRONZE and 'AC' makers mark on the edge it is definitely produced by the Chobillon firm. While there are fakes of the cuban they have not got the marks correct. I do not want to provide this detail as it will only educate the fakers.